Happy New Year! I hope 2011 is treating you well so far – I do love the sense of possibility that the new year brings. One of my goals for the year is to provide resources that will encourage you to play everyday with your kiddos. With that goal in mind, I have a download for you! Each month this year, I will have a one-page download that highlights 10 (or so) fun and simple ways to play and engage with your kids. The activities will not require a lot of materials or instructions. I will try to include activities that appeal to a wide-variety of age levels, too. 10 Ways to Play in January is ready to download! I plan to print this and hang it on my fridge. I’m pretty sure my girls will want to check-off each activity. I am definitely looking forward to having a go-to list when my creativity is lacking. 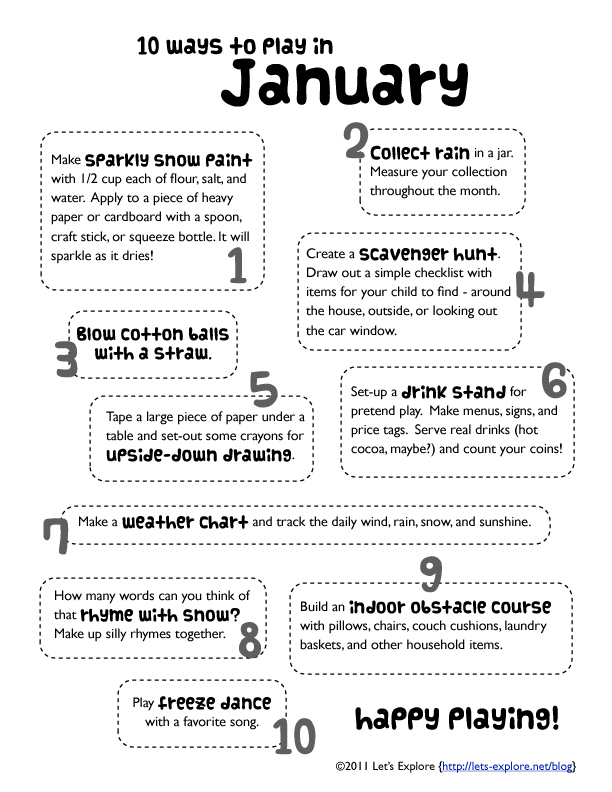 Download 10 Ways to Play in January. I hope you and your kids enjoy playing together this month! Speaking of the new year, is there anything special you would like to see here at Let’s Explore in 2011? I would love to hear your suggestions and feedback! Wow, what a great New Year’s gift. My resolution this year is more intentional one-on-one time with my kids each day. This is just what I need and it’s even stylish enough to keep on the fridge. Thanks!! cool! thanks! these are great ideas and i’m sure the kids will love reading them and deciding which one they want to do first! We’re going to need lots of ideas for playing inside on very cold, windy days. I love this! Printing it right now! Thank you so much! I’m looking forward to doing all of these with my daughters. Thank you for these fantastic ideas! My girls and I will have so much fun! Yay, we’ll join in too! Thanks for making this easy and fun! I can’t wrap my brain around number 1, lol, do you paint the snow with this paint, or is it just that it looks like snow? Really great ideas, thank you so much. The layout of the document was really fun as well! I am just starting to get my children ready to homeshool and am just setting up a space and collecting resources. Your site has been wonderful! Thank you for all of your ideas, effort and time! Thanks for this fun printout. Our family resolution is to have more quality and fun time together as a family. This will definitely be helpful! What a great idea, thanks for posting and sharing. I run a daycare and I am alway stumped for new ideas for imaginative play. Free dancing is favorite at your house. Love your idea! Oh how fun, what a great idea! Thanks so much for a month of fun, I’ll be linking. I’m thankful for this!! I can’t wait to have some fun! Thank you! I’m printing this off right now and I can’t wait for next month. Thanks so much for this. We have loved it. Thank you so much for this inspiring gift! So simple, and so obvious that cool ideas like these just don’t occur to me :0). LOVELY IDEAS!!! I love this! Thanks for sharing your great ideas! awesome ideas-I vowed to get down on the floor with my kids more, aka-do cool stuff together. – thank you- I might have to reblog about this! I love this idea! Thanks so much!! Thank you for this great resource! I am decidedly uncreative but love to do new things with my kids. I am trying to spend more time really being WITH them and not just around them. This will help me so much. I’m grateful for creative souls who share their gifts with the world. Amy, I’m so grateful your “Ways to Play” is still up and available. I did these with my daughter 3 years ago when we did homeschool preschool and now I’m excited to get to do this again with my 3 and 4 year old boys. They will loves these fun things (me too!!). Thank you, Kiasa, for letting me know that your family is still enjoying the Ways to Play printables. Makes me so, so happy! Can’t wait to pull these out with my little guy in a few years, too.